Okay, have you ever seen such an amazing/special print?! 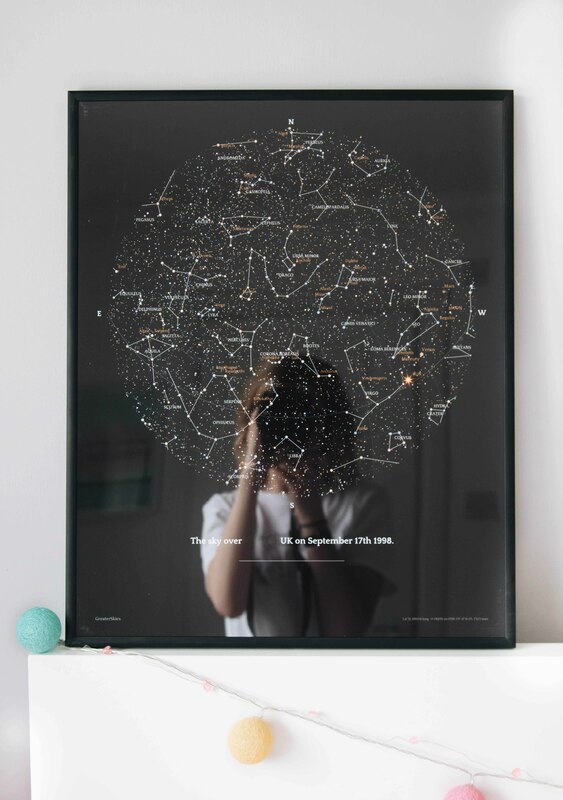 When Greater Skies got in touch with me, asking if I’d like one of their night sky star maps* I couldn’t say no. I’m such a sucker for anything with an astrological theme/connection, so its safe to say I was very excited about this. With Greater Skies, you can make your own personalised night sky map, using a specific date in time. I decided to go for my birthday because ya know, thats kinda special?! I did blur out the location on the photo as its too close to home and I don’t really want everybody knowing that. Anyway, this was how the stars looked when I entered the world, amazing! I think a print like this would be such a great present for a loved one/friend for their birthday, or even as an anniversary gift. You can also include a message underneath the location and date, which if you’re giving this print as a gift, would be perfect. I just think this is such a unique present to give to someone and definitely something they may not pick up for themselves or even think of. 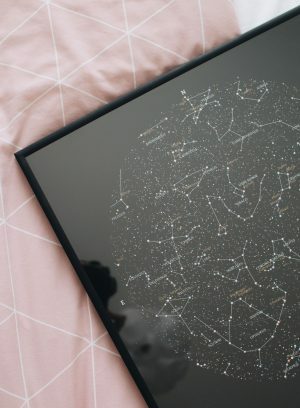 I just think its so cool to see how the stars were aligned at a certain point in time, especially when you’re born as this determines what star sign you are. I was talking to one of my friends about this and whether we believe in star signs etc. I definitely do and as she explained to me, the stars were at a certain point when you were born, creating an energy that reciprocates to you, when you’re born. Does that make sense? I don’t know, but I definitely want to learn more about astrology and zodiac signs. Its all so interesting!